Right now, a Commission of Unasur is visiting Caracas trying to mediate in Venezuela’s political crisis. As I was reading about it, I recalled Thatcher’s statement linking democracy and trade. The European experiment was not driven by economics, but by politics. Europe in 1945 was coming out of a long and bloody war, and democracy in the continent was fragile, yet it existed. As Thatcher explains, the free trade promised by the European Community was not viewed as an end unto itself, but rather as a way of consolidating democracy and peace in the Continent – free trade helping to spur growth and consolidate democracy, free trade as a weapon to punish countries that deviated from democratic norms. The most important factor is that it was not just consolidated in treaties or rules, but in the hearts and values of the people leading Europe. The European experiment was driven by democrats interested in democracy. The “trade” part was hugely important, but it was more an instrument than a goal in and of itself. Even a noted Euro-skeptic such as Thatcher understood that. Unasur is a thing (I don’t know what else to call it) created primarily by Hugo Chávez and Néstor Kirchner, and that right there should give us pause as to its commitment to democracy. Other boosters include Rafael Correa and Evo Morales … Brazil, with its indifferent attitude toward democracy in the region, also plays a big role. In other words, Unasur is about a lot of things. Democracy isn’t one of them. As a consequence, neither is trade. 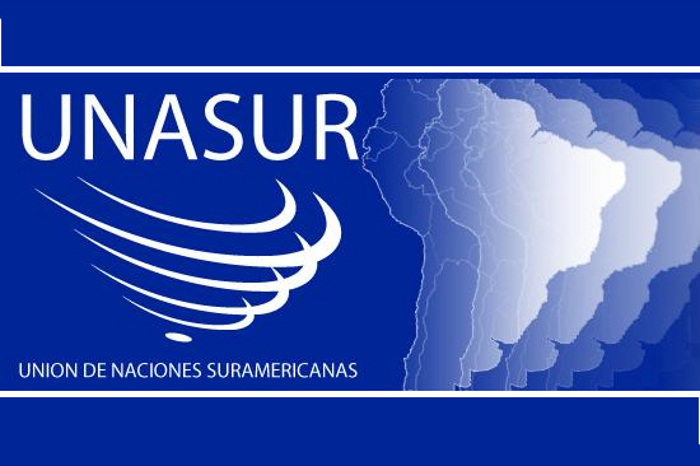 Since Unasur is not a vehicle for democracy, one can only conclude it is a vehicle for consolidating the status quo – the elected, left-leaning autocratic governments that predominate in the continent. Free-trade champions such as Peru, Chile or Colombia play a marginal role in Unasur. And because Unasur does not have democracy as its goal, it does not even concern itself with trade, development, or other forms of integration. As it turns out, Unasur is superceded on trade issues by other trade blocs, such as Mercosur (emphasis on block, not on trade) and the Pacific Alliance (emphasis on trade, not on block). These days, as we see Evo Morales’s foreign minister, Rafael Correa’s foreign minister, Cristina Kircher’s foreign minister lecture the Venezuelan opposition about democracy, we should keep this in mind. Regional bodies are a reflection of the people that lead them – and UNASUR’s current leader is Alí Rodríguez! We need democracy, we need trade, and we need regional bodies that support both, just like Europe. With Unasur we get none of these things. Unless it’s remade from the ground up, Unasur will do nothing to advance either democracy or trade. Until such a day, it cannot play a constructive role in our conflict. Previous articleNo soap for you! !